What is Page 1 of Google all about and why is it important for my business? We refer quite often to Page 1 of Google, or simply Page 1. Not sure what this means or why it is so vital to the online success of your business? We’re going to explain it in a way that is simple to follow. 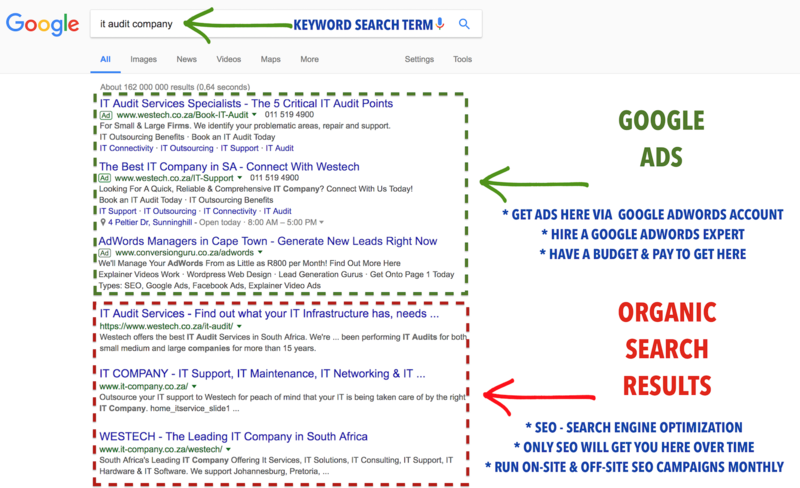 Basically, Page 1 is the first page of Google search results when someone types in a search term or terms. For example, take a look at the picture. You can see that there are a number of results for the search term “IT Audit Company”. This is Page 1 of Google Search Results. This is where you want to be. Why? We’ve broken it down for you. Search Engine Optimisation – Over time, your website climbs to the top of the organic rankings. This is one of the ways you can rank number 1 on Google and can take 6-8 months to see your website on Page 1 for your selected keywords. You can find out more about organic rankings vs paid-for search results here. So, now maybe you understand a little more about what Page 1 is and why is it so important when we refer to it. Your website should be on Page 1 for all of your keywords if you really want your business to shine! Need help promoting your business? Try doing it online. Another new website rebuild completed for The Business Exchange. What is the Difference Between Organic and Paid Search Results? We are specialists in generating online marketing solutions to drive new business to you. Our work inspires. We pride ourselves on delivering outstanding quality and design for leading clients. If you want to start climbing organic rankings locally you need to do this.